The naturally sweet, earthy flavour of our Crystals is a great sweetener for use over cereals, in tea, and all your favorite dessert recipes. 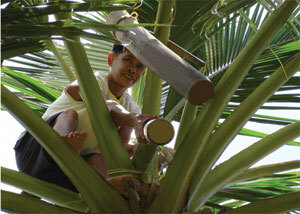 When the coconut tree is tapped, it produces "sap" that exudes from the coconut blossoms. This sap is very low glycemic (GI of only 35). Small batches ensure that our pure, low glycemic Coconut Crystals, made from this natural sap, is briefly evaporated at low temperatures for 90 minutes (only to remove excess moisture and allow for crystallization), never exceeding an average summer day in the tropics. By contrast, most brown sugar is boiled at temperatures up to 221 degrees F. (the end product containing 93% sucrose, compared to sap crystals which is only 16% sucrose).